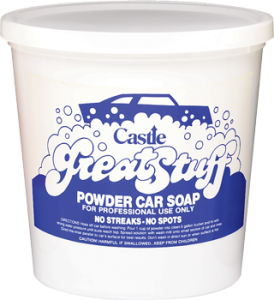 Castle® Great Stuff™ is formulated for maximum penetration and run off of soils and grease, leaving no streaks or residue. Special sheeting actions assure rapid spot-free drying. Great Stuff™ is gentle on the skin. 1. Hose off surface to be cleaned. 2. Pour 1 cup of powder into 5 gallon bucket. 3. 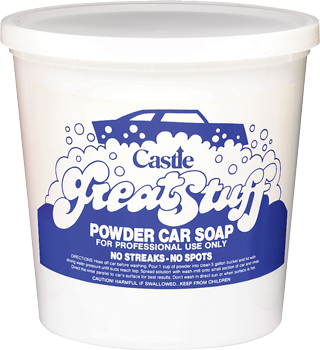 Hit powder with strong water pressure until suds reach top. 1. For pre-rinse, add 3 lbs. per 50 gallons of water and inject into pre-rinse station at adjusted dilution for soil conditions using hot or cold water. 2. For brush feed applications, add 2 lbs. per 100 gallons of water contained in solution tank. 3. Rinse vehicle surface before adding rinse wax to surface. Store in a very dry area.